Yesterday I cooked 4 chickens on beer cans at Paulo’s house. We called it Paulos Drunken Chicken. I adapted a recipe from the BBQ Bible for this. The BBQ rub was 5 equal parts of salt, pepper, nutmeg, paprika and brown sugar. I cut the top off each can of beer and left half the beer in the can. I also added two spoons of my BBQ rub mix to the beer so it would flavor and steam the chicken from the inside. It turned out pretty well. I might add some cayenne pepper next time to give it more of a kick. 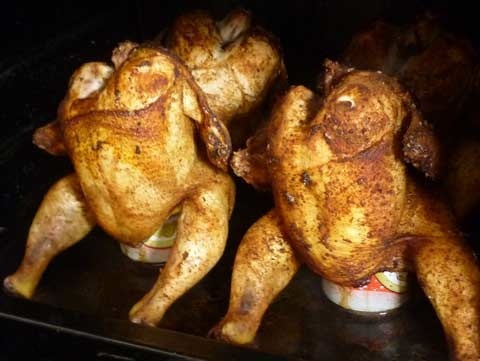 Its a great way to cook 4 chickens in a small oven and it looks fun also.